I thought this might be an appropriate follow-up to Monday’s blog about Setting Goals for the Soul. Goal setting is fabulous, but once that goal is set we have to break it down into actionable steps to accomplish that goal, little by little over a set amount of time. Your first step in this is to create concrete goals. Concrete goals include milestones and measurables so you stay on track and know when the goal has been accomplished. I found that creating goals attached to emotions help me form concrete and meaningful goals. However, you might find mind mapping helpful or simply dumping ideas onto paper and creating goals from there. Whatever your method, make sure the goals are concrete with a system of measuring included. Once the milestones are set you can write them into your calendar. Once the large milestones are set into your calendar and you’ve picked dates for their completion you can create actionable to do’s around the milestone. Let’s discuss what constitutes an actionable to do for a moment. 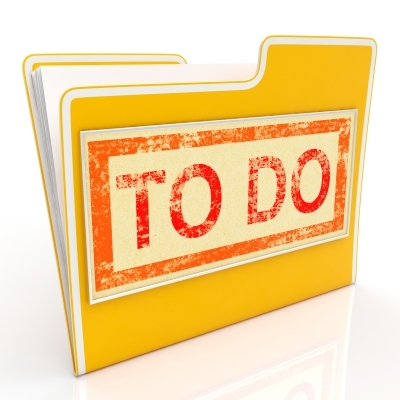 You want to take all thinking out of your to do list. Write it as if you were going to hand it some one else to complete. If you need to contact some one write out: “phone so and so and include their number”. Same with email, write: “email so and so and include their email address” Don’t put things on your to do list that you are not ready to complete. Only the next logical steps to any project/milestone should be included on your list. Be bold though, don’t leave things off simply for the sake of avoidance, but be careful not to put so many “hard” task on that you avoid it and feel guilty. A quick note here. Projects are not to do’s. Projects are a collection of to do’s and should be broken down accordingly. A to do should include one item only. So for example, “clean the basement” should never be on your to do list. What does that even mean? Here is a better way to approach that project with simple tasks: 1. Go into basement 2. create three distinct piles for donation, keep, give to kid’s 3. Clear five basement storage shelves sorting items into the tree categories 4. repeat step 3 as necessary 5. Take boxes to donation 6. pack up kid’s boxes 7. deliver boxes to kid’s house… Get it? There are a lot of steps in “clean the basement” and if you don’t properly think through those steps you are setting yourself up for failure. The success is in the planning, seriously! Another thing to consider is a concept I read about called “micro movements” these are tasks that take 5 minutes or less to complete and they create micro movement in accomplishing your goals. Think phone calls, emails, ordering a gift for your mom’s birthday, setting up your credit card on auto pay so you stop paying late fees etc. There are endless micro movements we could take advantage of in our daily life that would bring a huge sense of accomplishment – in five minutes or less. Think of three you could do today! Ok, so now it’s time to put your list together. Gather your goals with clear milestones and lay out your next week of to do’s. Try to keep your list under 20 items with a goal of 3-5 to do’s a day. When you scratch off those 3-5 add another 3-5 and now you have a running to do list with current and meaningful actionable items to complete to help you accomplish your goals. Remember this is a living, ever changing list, you can’t just write it and forget it. Set aside 20 minutes every Friday or Monday to review your to do’s. Further break down any items or take some time to purge items no longer relevant or maybe put onto the list too early and have been hanging out for a long time. This is a process and it might take time to adapt. Be kind to yourself as you begin to see your to do list in a new more effective way.